Selects the focus method to suit the movement of the subject. Turn the focus mode dial (A) and select the desired mode. The product locks the focus once focusing is complete. Use this when the subject is motionless. [Single-shot AF] and [Continuous AF] are switched according to the movement of the subject. When the shutter button is pressed halfway down, the product locks the focus when it determines that the subject is motionless, or continues to focus when the subject is in motion. During continuous shooting, the product automatically shoots with Continuous AF from the second shot. The product continues to focus while the shutter button is pressed and held halfway down. Use this when the subject is in motion. In [Continuous AF] mode, there is no beep when the camera focuses. You can make fine adjustments manually after performing auto focusing, letting you focus on a subject more quickly than when using the manual focus from the beginning. This is convenient in situations such as macro shooting. Adjusts the focus manually. If you cannot focus on the intended subject using auto focus, use manual focus. 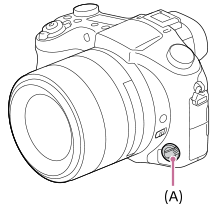 Rotate the front lens ring to adjust the focus manually in the direct manual focus mode or manual focus mode. The subject is in focus and the focus is locked. The subject is not in focus. The subject is in focus. The focus will be adjusted continuously according to the movements of the subject. When the focus range limiter switch is set to “∞-3m,” the camera focuses on subjects more than 3 m away in telephoto shooting (shooting with a 35 mm-equivalent focal length of 150 mm or longer). This function allows the camera to focus more quickly on distant subjects by keeping it from focusing on subjects at close distances in telephoto shooting. An icon indicating the status of the focus range limiter is displayed on the monitor. : The focus range limiter is not applied. The camera focuses anywhere within entire shooting distance. : The focus range limiter is applied. The camera focuses within a limited range from approximately 3 m to infinity. When the focus range limiter switch is set to “∞-3m” in non-telephoto shooting (shooting with a 35 mm-equivalent focal length of less than 150 mm), appears, and the camera focuses anywhere within entire shooting distance. In [Continuous AF] mode, you can lock the focus by pressing and holding the focus hold button. When you set the focus to infinity in the manual focus mode or the direct manual focus mode, make sure that the focus is on a sufficiently distant subject by checking the monitor or the viewfinder. Even if the focus mode dial is set to S, A, or DMF, the focus mode will switch to [Continuous AF] when shooting movies or when the mode dial is set to . Depending on the usage conditions, even if the focus range limiter switch is set to "∞ - 3 m," the shortest shooting distance may be slightly smaller or greater than 3 m.